We help innovative companies build great apps, digital products, and services. By approaching things from the needs of the user and turn complex processes into simple and consumer relatable solutions. When's the last time you've send a postcard? If you're anything like the rest of us, you've sent it from your vacation. Or to wish a relative the best for their birthday, anniversary. Or to send an occasional update to the elderly. If the question were about your last text message, the answer would probably be somewhen in the last five minutes. And that's what's up. For the larger part of us, postcards have been replaced with instant messaging — or photo sharing platforms like Instagram. Or Snapchat. Or Facebook. We still remember postcards from the earlier days, but the pace of technology has moved them into the background. As trivial as it may seem, we started with an analysis of where the postcard is struggling and where it persists. Two key findings helped us mark the rough edges of our digital interpretation of how the postcard can live on. Speed is what has slowly replaced them. Postcards take time. And postcards don't show the moment but a stock image. And we live in the moment. We live in a selfie-centered world. People live-share experiences. Photo and video broadcasts alike. Postcards on the other hand travel at the speed of transportation and logistics. A memory in the mail weeks after an event took place just doesn't do. At the same time this slow traveling memory in the mail is what still makes it special today. People love postcards for all it's personality and physical touch. It goes on the fridge or a wall and doesn't get lost in an endless stream of digital posts. It's infinitely more personal to receive a message via the postal mail than a *dingding* that comes with a text message. From the initial prototypes of our postcard app we started right in your camera roll. Everything developed from there. You pick one or more photos you want to send, and get to chose layout and details from there. The design was kept clean and centered around where we want the user to go within the app and which actions we need him to take. We tried to find a balance between features and streamlined funnel—something to be validated once we give it in hands of a couple of thousand users. We made the conscious decision to use illustrations over professional photography. Photos taken on mobile phones aren’t perfect. And that makes them perfect. Illustrations allowed us to tell the user about the product and it’s feature without putting the product in a real life setting and thereby define who we’re talking to primarily. Now that we’ve given the product an identity we started defining the color palette, find the right illustration style, balance typography and match iconography with it. We developed standards across a variety of elements ranging from spacing, type, color, animation, error and success states, buttons, empty states, tabs, popup and popovers. All in an effort to let your resulting postcard be 100% you. Illustrations coupled with subtle animation also helped us make waiting times less painful for the users. Waiting for an image upload turned into a playful animation that kept the user entertained while a boring upload process happened behind the curtain. We then added a message to the back of the card. Just like you're used to. And the option to sign the card with your finger. We came up with mail stamps that are generated from date and location data of the time the postcard was created. This was to imitate the charm of real stamps on the back of mailed postcards that travel across countries, continents, planets. Okay, maybe not planets. But you get the idea. We tried everything to emulate the personality of the traditional postcard. It felt right. Postal mail takes time. Even more so when sent across countries, let alone continents. So we decided to go about things the technology way. We contacted printing facilities across the US to find a network of a balanced spread of locations throughout the country. Depending on where your postcard gets sent to, our backend was ready to route your postcard to the printer located closest to it's destination. This would cut shipping times from weeks to just a few days via USPS. And shipping rates would be domestic, because the postcard travels the longest distance via the Cloud. We were now ready to launch our app. Ready to learn from users. It was early on but we wanted to collect as much data as possible before we continue building something that only works in our concept rooms. Is there a market? Does our flow make sense to masses? How much do people love our powerful editor to make the most out of their photos? Payment options are fine? How's the price point in general? The list goes on. Just a little over $2.500 in marketing spend and 4.000 users later we were ready to take a peek at the data we collected from analytics and in-app surveys. The findings were disastrous. People only used a fraction of the editing tools we gave them in the photo editor. So we sent our editor to fat camp. 70% of the editor tools were sweated out. The result — almost 40% less churn in the editor. Next up was payment options. We offered Paypal and Credit Card. No accounts, no hustle we thought. Wrong again. People were asking for bulk purchases. So we added accounts and allowed people to purchase sets of 5, 15, 25 postcards. This impacted 15% on postcards sent overall and 35% for individual users, as they felt the need to empty out their postcard inventory whilst traveling. Our demographic, however, was quite old. Was the postcard not hip anymore? Don't millennials care? Or don't they want to spend $1,99 on memories? While we tried a variety of ASO tactics to improve icon and app headline and screenshots, we found Emoji attracting an entirely new demographic. So we added one of the most popular features in instant messaging: Emoji and stickers. This lowered our demographic average and helped us to bring the postcard to more millennials. Here our main objective was to try and sell the product to potential customers. And inform those interested in writing about the product. And give answers to those looking to browse the FAQ. Or recruit. A blend of targets that required a clean but fun design approach. We picked up the illustration style used throughout the app to set the tone. And we explained the core use through a 46 second video. Other fun features were highlighted in tightly written sections. After we spent about 8 weeks going back and forth on features, improving our purchase funnel for first-time users. We've cut out any unnecessary steps that are not required to make a purchase. Our product has one strong use case; we focused on that flow and nothing else. It was a great reminder for us to think simple and cut through the clutter that comes with features. "Turns your photos into personalized postcards"
GUESS are positioned between affordable and luxury. Their fans and customers are in the market for the latest trends, flashy heels, trendy outfits and coolest accessories. Like watches. GUESS are amongst brands who realize demand for smart watches and believe that they can change the watch market in a way that quartz technology forever changed the watch industry in the late 1970’s and early 1980’s. You don't have to compromize style with getting to use latest technological features. We were approached early in the process. Prototype early to be exact. We received an unbranded watch directly from the chipmakers to start with. After boiling down a long list of requirements and expectations from the market towards smart watches, we ended up with an array of features that find use in day to day life. It ranged from Voice to Text-Messaging, Place & Receive Calls, Set Appointments & Reminders, Voice Command to all Apps, Camera Control, Music Control, Find Phone, Do Not Disturb, App Notifications, to Custom Vibrations and Digital Time or second Time Zone. Immediately, there were so many practical use cases for a designer watch that can do more than display hour and minute markers but are easy and accessible enough for everyone to get started with them right away. Our job as a design studio is always to turn complex things into simple, bite-size chunks that everyone can understand. In this case added complexity came through a lot of features that people outside of the tech world have never heard of—let alone used before. And the name alone won't teach the functionality behind it. For the companion app of the watch, we developed an easy to follow onboarding process. Something as boring as enabling a digital leash to find your misplaced device turned into a fun 15 second experience. The software made the many functions of the watch feel like a breeze. After months of groundwork and app development, it was time to use the learnings about positioning and understanding of how the fashion world understands tech. 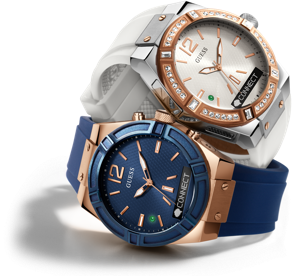 The launch of GUESS Connect watches would be primarily on the Internet. Their new website was going to be their main hub to introduce and sell the watch online. Every digital campaign would send leads there. The website would feature the different watch designs, explain features and handle customer support for 10 markets. "All content was localized, but displayed based on region"
GUESS Watches have a complex network of distributing to global markets. The GUESS Connect website had to respect all of them and their territorial agreements and contracts. The solution was to separate content from language. A customer from Germany, for example, could now also enjoy the website in any language while still only displaying content specific for the German territory. The designer smartwatch was the first global push for the GUESS brand into the tech space. A product that's new to their customer base. Together with their campaign team, we developed a design language that borrowed strong elements from the known and trusted mother brand to create a distinguished appearance that works across different campaign styles. By now, it was more about tuning the design language already in place across the app economy, than reinventing the dial. We had to make sure we're doing an equally good job in presenting and explaining why the watch is a good buy for the fashion focused. So we put the product first, and let it do the talking. When the day of launch came, it came big. Our engineering team was ready to burst scale the computing power behind the servers on demand to serve hundreds of thousands of visitors. GUESS Connect turned into a runaway success. Their regular watches were already known to sell well and with everything moving into a connected age, GUESS were early to position themselves in the designer smartwatch space. Press picked it up all around the world quickly and reviews were excellent. "Wearables You Will Actually Want to Wear"
"These 5 Smartwatches Are Way More Stylish"
Working so closely with the producers of the technology of the smart watch right from the start, and being able to touch so many different aspects of the smartwatch experience from the actual physical watch, to developing the app, to creating the global website and finally launching the product gave us many insights and sharpened our eye in more ways than words explain. Redesigning a brand that works is always a challenge. With Iris von Arnim it was no different. Their brick and mortar stores were selling volumes, the online store was working well. Very well in fact. Especially considering that it didn't get the focus it deserves so far. Valentin von Arnim, Managing Director, knew there was unused potential for the brand his mother and business partner built. He wanted to make sure his family business stays ahead of the competition and is ready for his customers wherever they may shop his products. As trivial as it may sound, we're talking about a brand that is all about how highest grade wool is made into wearable fashion. The right materials, shapes, colors and cut is what made them known across the world. It's the secret sauce that turned a backroom vision into a multi-million business. In order to understand what they are all about, our lead designers went to their headquarters to learn about these seemingly subtle differences in material. One key area of the experience was the checkout. The Iris von Arnim customer is best described as inexperienced and, for the most part, offline. The type of customers that prefers to talk to another person on the phone when ordering something they can't do in person. The type of customer who almost shies away from ordering online. The type of customer you don't typically have in mind when designing an online shopping experience. So now our challenge has extended from cashmere quality to maintaining the most simple and easy to follow shopping flow one can think of. From the start we wanted to be sure to create a storefront that has as many faces as the wonderful products Iris von Arnim offer. And one that is versatile and universal alike. So with every seasonal new product release, the site delivers a different experience. Just like the product. At the same time we developed standards across a number of elements from foundational parts like grids and spacing, typography, colors, content, icons, photography style, animations. These were part of the red thread we needed to weave through the project to make the experience seamless and familiar. We used to think that our job was done once a customer added a product to the cart and reached the checkout. But as we looked at how customers behave in store, we realized we were neglecting the longest part of the shopping process: browsing. We thought about how customers prefer products that are curated by Iris herself, how they go hop from sweater to cardigan to scarf to dress and back, how one piece they fall in love with influences the rest of the products they may buy. We built a shopping experience that will put you and your browsing experience at the center. Selected by the Cashmere Queen herself. We all know that shoppers don’t limit themselves to a desktop experience anymore. Same goes for the older than average consumer group of Iris von Arnim. This is exactly why we started optimizing for a tablet experience first, and then made sure it works fine for the desktop users. Smartphone shoppers won’t be left behind with a reduced and lighter experience that lets anyone do their luxury run on the go. To further bring the shopping experience to life and add another dimension to the website, we’ve integrated the never ending streams of product shots on Instagram to it. Now every customer can see which superstar in LA or NYC is wearing which Iris von Arnim sweater, cardigan, jacket, scarf, skirt, blouse and matched it with their outfit. Not only does this help to inspire customers but also increases average cart worth and conversion rates. While Iris is a super high end fashion brand, Instagram got more and more important for them, too. Celebrities like Heidi Klum wearing their clothing, Instagram became a super important marketing channel. So instead of just linking out to their Instagram profile, we tried to integrate their feed into the site as seamlessly and editorial like as possible, giving the startpage something new & fresh to explore every other day. After a vast exploration phase we ended up with a perfect blend of the editorial, brand and ecommerce world that all live under the Iris von Arnim name. We put their beautiful campaign and product imagery into the spotlight. Copy took a backseat, while subtle animations and highlights in fashionable taupe stepped up the product presentation. After the store went through multiple stages of user testing and improving the infrastructure to allow ultra high resolution imagery with swiftest loading times, we put our work to the test by launching the site alongside their Spring/Summer collection. Average cart sizes have increased 200% and monthly revenues by over 300% in the first months. As with everything, we kept improving the UX here and there to serve the best possible experience to their customers. Imagine you can use a service like PayPal at your local supermarket. You stand in the queue, once you’re up, whip out an app and pay instantly. From your mobile phone. Yapital is exactly that. They’re a consumer oriented startup owned by the OTTO Group, that partnered with supermarket chains, retail stores, cinemas, all types of companies to push their app into the market and hands of millions of people. Yapital quickly learned that their service was initially way too complicated to sign up for and use. The product was straight up unappealing and unstable. Trouble on multiple fronts. "I feel lost. I have no idea what to do or where to click first." "Retention is very low and we don’t know why." "Currently we lose the majority of users before they even do their first transaction." "It feels like there is always another step. I just want to start using it." When Yapital approached us, we needed to get as much data and insights about why the currently product is failing. And we needed to get it fast. The problem was the complete lack of analytics in any software that was live. Our first immediate step was to conduct user studies. We already identified a couple of things that required improvement, but we needed additional verification from actual users to increase efficiency. We brought in 50 people over the next weeks, recorded them using the product from signup to payment to dealing with app side issues. We asked a lot of questions. Then we did the same thing with Yapital users. 1. How likely are you to recommend Yapital to a friend or colleague? 2. What is the one thing that you would like to see changed? It takes way too much time. 3. Would you say the Yapital app is easy to use? Before building anything new, we focused on stripping away the old stuff and getting the core of the product. The part that we felt was the most important one and tried to build up again on that. At the beginning of all of this was the onboarding—so far only 2 out of 10 users who started the signup process, actually finished it. This was alarming, because if we do not get people into the product in the first place, none of the other improvements will make any sense or impact. Additionally, marketing efforts and dollars will mostly go to waste. During the initial sign up process. We analyzed the current sign up flow and realised that it was simply too overwhelming and complicated. 8 different screens, a lot of body copy and not enough visual hierarchy just screamed at the user: “this will take a lot of effort”. In order to streamline this process, we used an analogy from promoters on the street. Where they slow you down first with a few simple questions and all of the sudden you are in the process and put too much effort into it, to quit. That is what we applied to the signup flow. Instead of having those large screens with a lot of information at once, we not only stripped a lot of stuff away, but spread it into chunk size pieces that were much easier to digest. Yapitals branding was based on the three primary colors, #9835E2 , #F38C23 and #ffffff . However and where dominating not only the marketing website but the product itself, giving it a very cheap and childish look. Especially combined with the kind of brush font they were using on multiple parts of the app. We reduced the use of color to important call to actions, introduced much more white space to create a cleaner and more mature design direction. Together with a more professional and less bolder typography we created a much more trustworthy look. Something you feel more comfortable with when it is about your money. One major issue we discovered during our research phase was the iconography. It played a critical role in the original design of Yapital and led to a lot of confusion with consumers. The original iconography was based on some longer branding story the inhouse design team came up with in the very beginning. It was supposed to resemble stones, a popular payment method on an island that was the inspiration for the name Yapital. Without all this background information however it was almost impossible to understand and the interface became very unintuitive for consumers. Risking to lose some of the branding story, we went a step back and introduced a clear and very common icon language across the whole product to explain functionalites, be familiar to other more established services and simplify the interface. But it was not only the iconography. A lot of interface elements and flows were pushing too hard. They introduced control schemes and flows that were not familiar at all, which was too much for a product that had to be introduced itself first. Here as well, we worked on a more common interface, people would understand and recall quicker and by that having a faster learning experience with the service itself. As a user all you care about is a quick overview. Transaction details are secondary but still necessary. Balance, sending and receiving money: Those information and functions should always be at your fingertips. Merchants need a quick cash flow overview. How many purchases were made by how many customers and who are those. Today, yesterday, last week, 30, 90 day shortcuts to help compare business results and measure growth. Just a few weeks shy of launching the newly tested designs & prototypes, the project was put on hold due to financing issues of the company. A few months after attempts to find a buyer, Yapital was shut down by the OTTO Group. Our work sadly never got the chance to prove itself in the hands of the users of the service. We still feel it was an interesting process that we wanted to share. Camparound approached us as they were looking for a partner to help them properly build their future camping experience vision. They had a lot of early stage tech and design in place but it wasn’t executed with one clear vision. Their product was built by people who love camping. But not build for people who go camping. "We would like to be the tripadvisor of camping"
It quickly became clear that while being a big industry, camping had not been disrupted by technology yet. Campsite owners were not familiar with modern applications or features. And their customers weren’t missing anything from their current experience. It’s always been analogue. They were used to it. So the idea to build the Yelp of camping was equally exciting as it was scary. We went back a few clicks and looked at the product from a bird's eye perspective. We left everything that was created so far behind and defined the core funnel for the app. Something that’s easy to optimize against once we collect proper usage data. It was important to test and verify assumptions quickly, so we built high fidelity wireframes and used InVision to turn them into prototypes. This allowed us to run user tests within days instead of weeks and to do edits and tweaks on the fly. It was finally time to overhaul everything visual. And we left no stone unturned. Our team knew exactly where and how to start: Key components have already been defined during the UX phase so we proper tool box to test our designs against. One of the few things that were set in stone by the client was the use of red as primary color. So from there we chose a very clean and modern direction combined with a uniquely crafted iconography style. Camping happens close to nature and is an experience as authentic as it gets. It was a challenge to find a photographic direction that represents this. There were a plethora of options from cheesy and staged to amateur and shot in the moment. In order to elevate the dusted image of camping and make it appealing to a broader and younger audience we used a lifestyle mix that went beyond the actual campsite. With every new feature that was brought to life, we always went back to challenge our core set of components. Tweaking them, optimizing them. Making sure they hold up to the growing amount of information to be displayed in views, modals, notifications and such. As fast as the platform grew, as fast as the features grew, it was imperative to keep our cool with a universal direction. In order to manage the growing content of the platform, we developed a powerful backend interface that let the different user types be in charge of their own content. We spent most energy on a robust UX that takes care of users, owners and admins alike. For campsite owners this meant an array of features, analytics and editing tools. For regular users it’s merely to be in charge of their profile and history for reviews and bookings. Of course it allowed for different admin access types like editing teams who update homepage categories of the mobile apps, general staff that keeps things tidy and the few admins who can do it all. Like with many of our clients, this was a long term project that is constantly evolving. While we’ve by now completed our main task of creating a sustainable basis of the product that allows the company to go forward without us, their next challenges are just around the corner. User acquisition, retention and ultimately getting to a positive LTV of those. Within just a few months we built the first version of the product and put together an exciting roadmap for the next months to come. Our team left them with all the tools and features in place to expand the product with features with ease. We can’t wait to see where the camparound team takes this and are happy to have been part of the journey. Appico is a Hamburg-based design studio, specialized in experience & interface design. We help enterprises approach things from the needs of the user and turn complex processes into simple and consumer relatable solutions. With clients like Electronic Arts, GUESS Watches, METRO GROUP, Hyundai or Eventim, we are deeply immersed in a variety of industries worldwide. Established in 2013, Appico is led by its two founding partners — Gordian Frank and Sebastian Chill. Both have worked as Interactive & Design Directors with international clients and agencies for more than a decade. Appico was built to be different. An alternative to large agencies. A chance to strip away the bureaucracy and overhead that usually comes with it. We feel that the people who do the work, are the ones who should talk to the client directly. This keeps our process agile and collaborative. We are always revising, testing and evolving single components and features based on feedback and data analytics. We see design as a strategic process, rather than just a beautiful surface. A process that requires a deep understanding of our clients, their industries and objectives. A process that always starts by listening first. To us, design is never done. It constantly requires us to challenge our work along the way. While maintaining very high standards to everything we do, we are focused to deliver quickly, test, optimize and then test again, working closely with internal product teams or founders. This process usually stretches over a longer period of time and is one reason why we see our clients as partners. Our core work usually involves some form of interface design. Whether it is a mobile application, web platform or wearable device, we always try to create design from a human-centered perspective that enables clear interactions between the user and the product. At Appico we believe that the hardest problems are never solved alone. This is why we are driven by our work, not our egos. We are confident, but never cocky and we are looking for team players, who have the same values. You will join a highly motivated team of talented people, who like solving problems and creating meaningful experiences. Expect your ideas to be challenged but never criticised. We have flat hierarchies and the best solution always wins, no matter who comes up with it. Our office is located across the town hall, right in the vibrant city center of Hamburg. The area is packed with dozens of restaurants, cafés and shops. The loft space is designed to support a collaborative culture between all team members. Enjoy a stocked fridge with snacks & drinks, work from a comfortable couch or take a break to challenge a co-worker for an intense Fifa match. In order for you to produce your best we aren't paying attention to when you get to the office, and we don't care who stays at their desk the latest. Enjoy a stocked fridge with snacks & drinks, help yourself with some nice tea or get coffee from the coffee shop across the office. It’s all taken care of. We want you to be comfortable, so just leave your shoes at the door and wear something more confy. Everyone at Appico has an own pair of slippers. We understand that everyone needs a break from work sometimes. Play on any mobile device or challenge a co-worker for some Playstation 4 gaming. You will work with a team of talented designers and developers to build world-class products for our clients. Those products will range from marketing pages, to web apps, mobile apps, wearables and more complex platforms. From early stage and growth stage startups to well established enterprises. With a love for defining user experiences for tech products, you care deeply about the end user of a product. You are not only able to break down complex processes into simple and enjoyable experiences but communicate those concepts to the team and client. A solid up to date understanding of best practices and trends in digital product design. You will work with a team of talented designers and developers to build world-class products for our clients. Those products will range from marketing pages, to web apps, mobile apps and more complex platforms. From early stage and growth stage startups to well established enterprises. You love to design things that work and see yourself more as a problem solver than an artist. You can deliver pixel perfect designs, but also understand how to quickly communicate ideas in the early stages of a project. You will work with a team of talented designers and developers to build world-class products for our clients. Those products will range from marketing pages, to web apps and more complex platforms. From early stage to growth stage startups and well established enterprises. With attention to detail you love to turn designs into beautifully written code that is easy to maintain. You are comfortable in a fast paced environment and have experience across the tech stack to work on a variety of projects. With attention to detail you love to turn designs into beautifully written code that is easy to maintain. You are comfortable in a fast paced environment and have experience in mobile development stack to work on a variety of projects. You will work with a team of talented designers and developers to build world-class mobile products for our clients. Those products will range from simple MVPs to more complex apps and platform integrations. From early stage to growth stage startups and well established enterprises. Appico GmbH, Rathausstraße 4, 20095 Hamburg. Bei Fragen bezüglich der Verarbeitung Ihrer personenbezogenen Daten können Sie sich jederzeit an unseren Datenschutzbeauftragten unter dataprivacy@appico.com richten. Beim Aufrufen unserer Website werden durch den auf Ihrem Endgerät zum Einsatz kommenden Browser automatisch Informationen an den Server unserer Website gesendet. Diese Informationen werden vorübergehend in einem sogenannten Logfile gespeichert und bis zur automatisierten Löschung gespeichert. Hierbei handelt es sich um die IP-Adresse des anfragenden Rechners mit Datum und Uhrzeit des Zugriffs sowie der Name und die URL der abgerufenen Datei sowie die URL der Website von der der Zugriff erfolgt. Außerdem werden der verwendete Browser, das Betriebssystem Ihres Rechners sowie der Name des jeweiligen Access-Providers identifiziert. Zum Zwecke der bedarfsgerechten Gestaltung und fortlaufenden Optimierung unserer Seiten nutzen wir Google Analytics, ein Webanalysedienst der Google Inc. (https://www.google.de/intl/de/about) (1600 Amphitheatre Parkway, Mountain View, CA 94043, USA; im Folgenden „Google“). In diesem Zusammenhang werden pseudonymisierte Nutzungsprofile erstellt und Cookies (siehe unter Ziffer 4) verwendet. Die durch das Cookie erzeugten Informationen über Ihre Benutzung dieser Website wie Browser-Typ/-Version, verwendetes Betriebssystem, Referrer-URL (die zuvor besuchte Seite), Hostname des zugreifenden Rechners (IP-Adresse), Uhrzeit der Serveranfrage, werden an einen Server von Google in den USA übertragen und dort gespeichert. Die Informationen werden verwendet, um die Nutzung der Website auszuwerten, um Reports über die Websiteaktivitäten zusammenzustellen und um weitere mit der Websitenutzung und der Internetnutzung verbundene Dienstleistungen zu Zwecken der Marktforschung und bedarfsgerechten Gestaltung dieser Internetseiten zu erbringen. Auch werden diese Informationen gegebenenfalls an Dritte übertragen, sofern dies gesetzlich vorgeschrieben ist oder soweit Dritte diese Daten im Auftrag verarbeiten. Es wird in keinem Fall Ihre IP-Adresse mit anderen Daten von Google zusammengeführt. Die IP-Adressen werden anonymisiert, so dass eine Zuordnung nicht möglich ist (IP-Masking). Sie können die Installation der Cookies durch eine entsprechende Einstellung der Browser-Software verhindern; wir weisen jedoch darauf hin, dass in diesem Fall gegebenenfalls nicht sämtliche Funktionen dieser Website vollumfänglich genutzt werden können. Sie können darüber hinaus die Erfassung der durch das Cookie erzeugten und auf Ihre Nutzung der Website bezogenen Daten (inkl. Ihrer IP-Adresse) sowie die Verarbeitung dieser Daten durch Google verhindern, indem Sie ein Browser-Add-on herunterladen und installieren (https://tools.google.com/dlpage/gaoptout?hl=de). Alternativ zum Browser-Add-on, insbesondere bei Browsern auf mobilen Endgeräten, können Sie die Erfassung durch Google Analytics zudem verhindern, indem Sie auf diesen Link klicken. Es wird ein Opt-out-Cookie gesetzt, das die zukünftige Erfassung Ihrer Daten beim Besuch dieser Website verhindert. Der Opt-out-Cookie gilt nur in diesem Browser und nur für unsere Website und wird auf Ihrem Gerät abgelegt. Löschen Sie die Cookies in diesem Browser, müssen Sie das Opt-out-Cookie erneut setzen. Weitere Informationen zum Datenschutz im Zusammenhang mit Google Analytics finden Sie etwa in der Google Analytics-Hilfe: https://support.google.com/analytics/answer/6004245?hl=de.